As permafrost thaws deep into the Arctic ground, history is unlocked from the ice. Even preserved young baby mammoths have been found here by Yar-Sale guide Karill Seretetto . Considered a bad omen by the Nenets marking the finder of such mamont remains to an early death, seems less superstitious once in this thawing landscape. The tundra ground that gets its stability from the permafrost has started to collapse , emptying lakes of water and creating dramatic gulleys. Most worryingly triggering the decomposition of organic residues releasing greenhouse gases such as methane into the atmosphere. Anatoliy Hoodi and his family live by a collapsed lake. A two day journey from the start of the Yuribey river, Anatoliy and his family have lived here dependent on fish for years. Two years ago the water level in lake Tayoumato that the family rely on for food dropped several metres. All that remains now is a flat sandy pool of shallow water and the skeleton of former banks. ”After the winter I found hundreds of dead fish around the lake,” he states over a cup of tea briefly escaping the plague of mosquitoes inside the smoky chum . "It sounded like a gas explosion and a deep rumble of land collapsing," he continues. The youngest child frantically dips dried pretzels into a tin of canned sweet milk evidentely brought by visitors from far beyond these parts. It's stuffy inside the dark tent, the air stands completely still wreaking of strong fish hung out to dry above a small fire. The family own no reindeer and depend on dried fish as their staple diet preserving for when the lakes freeze over in the bitterly cold winter months. 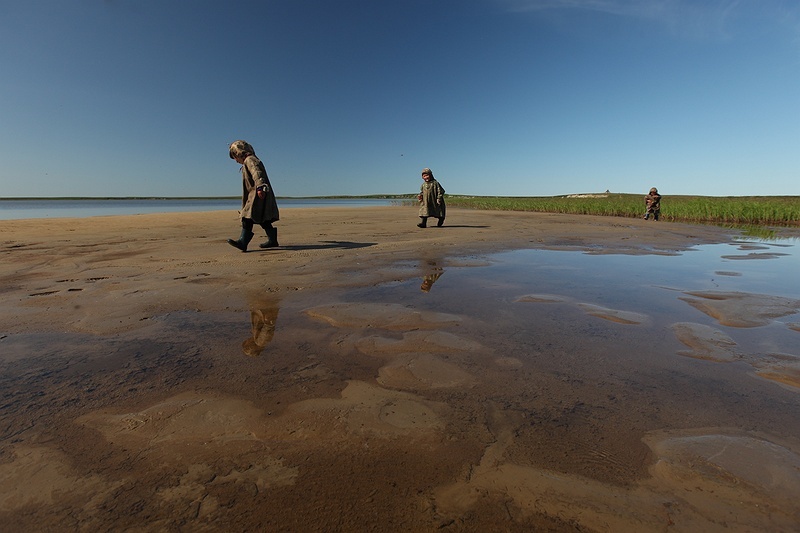 "Since the lake disappeared I have to walk a long way to catch fish," Anatoliy slumps into his comment taking his remaining tea in one gulp. Standing on a now overgrown seven metre steep bank Anatoliy points to what used to be the edge of Tayoumato lake. "We find a lot of things here since the water disappeared," he says and swings up a half metre long mammoth bone on his shoulder. Catching his breath he adds, "It gets more common that we find bones from ancient times now as the landscape is thawing." For Anatoliy and the Nenets people of Yamal these changes are indeed a bad omen, soon to mark the end of their traditional way of life and culture which has survived for over a 1000 years . For the rest of us it is a climate tipping point. Scientists are beginning to hypothesise the impact vast quantities of methane being released will have on the global climate system.